Your kitchen is one of the most visited rooms in your home. You are in it every day. Shouldn't it be one of the rooms you love the most? You may find yourself looking to change the look of your kitchen to reflect a style that more closely reflects your personality. But what if you don't want to do a full renovation or maybe you don't have the budget for a full renovation right now? In this article, we'll talk about some easy ways to completely transform the look of your kitchen without breaking the bank. One of the best ways to completely change the look of your kitchen is to change the floor. Also, it is often a simple and inexpensive way to accomplish a radical change in the look of the room. Maybe you have a tile floor, but you would really like more of a rustic feel. The problem is that hardwood floors can be expensive. In that case, you may want to go with a floating floor. You can get these in a variety of materials including laminate and engineered wood. The best part? It's usually not that expensive! Changing the type of flooring you have in your kitchen is a very fast and effective way to take your kitchen from "blah" to "ah!" We have all been in "that" kitchen before. "I love those cabinets and that is a really nice floor, but what is with those countertops?" It is even worse when "that" kitchen is YOUR kitchen. Fortunately, it doesn't have to be expensive to solve that problem. In fact, laminate countertops are often very affordable. However, if you have a slightly larger budget, a good option may be to go with a butcher block countertop. Butcher block countertops are a beautiful addition to any kitchen and even though they are more expensive, it still won't cost a fortune to go with this option. We suggest checking out Top Chop Butcher Block if you are interested in that option. The great thing is that simply changing your countertops can change the feel of the room entirely. That and the fact that this is a very affordable option makes this one of our favorite choices for updating the look of your kitchen. Maybe you like the look of your kitchen overall, but it just seems to be missing that certain something. You can't quite put your finger on it, but you know there is an improvement that can be made that will really make the room pop. Maybe what you need to pull the room together is a backsplash. There are many styles of backsplash available, so it should be easy to find one that compliments your style. A new backsplash is another great way to improve the way your kitchen looks without spending a lot of money. You knew this was coming, didn't you? As we are a cabinet door company, we would be remiss if we didn't talk about refacing your cabinets. This really is one of the best ways you can possibly transform your kitchen without spending a fortune. Your cabinets are one of the most prominent parts of your kitchen. It is no secret that changing the look of the cabinets will entirely change the look and feel of the kitchen. However, installing new cabinets is not exactly a cheap option and it is very labor intensive. Refacing your cabinets, on the other hand, is not expensive or labor intensive. Replacement cabinet doors and drawer fronts are a great way to quickly update the look of your cabinets. 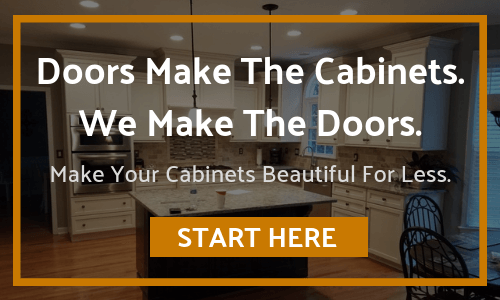 At Cabinet Door World, we provide high quality doors, drawer fronts, drawer boxes, and more to help you to dramatically improve the look and feel of your kitchen. It probably doesn't need to be said, but we'll say it anyway. This is our favorite option for making your kitchen look like a new room. If you would like to see some of the options that are available to help inspire your creativity, start by taking a look at our selection of cabinet doors. Our hope is that this list will help spark your creativity and inspire you to begin looking at the potential of your kitchen. There is simply no limit to the ways that you can make your space uniquely your own! » What Is Cabinet Refacing?